This will be an ongoing serial, dedicated to highlighting personal situations where having an iPhone proved to be highly useful. So, I pulled out my iPhone, went to the App Store, and searched for “German Translator.” In the search results was the app “Free Translator,” so I downloaded it over the 3G network. 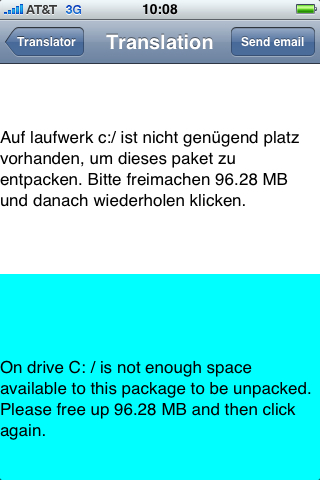 When the app was finished installing, I launched it, selected my source and target languages, typed the German error message, and hit the “Translate” button. Boom, now we could read the error message.